I don’t often blog food holidays, but Pi Day is one of those food days I can really get behind. This years pie is influenced by a recent trip to Central America, where almost everything is spicy. We just got back from one of the best vacations we’ve ever taken. We visited Mexico, Belize and Honduras (to name a few), and sampled some excellent food. Spice is the name of the game in these parts, and it really rejuvenated me, and gave me so many ideas for things to try when I got home. While in Mexico, I came up with this pie idea and knew I had to make it for Pi Day. Admittedly this is more of a tart than a pie. I’m a rule breaker, and I’m sure you can forgive me. 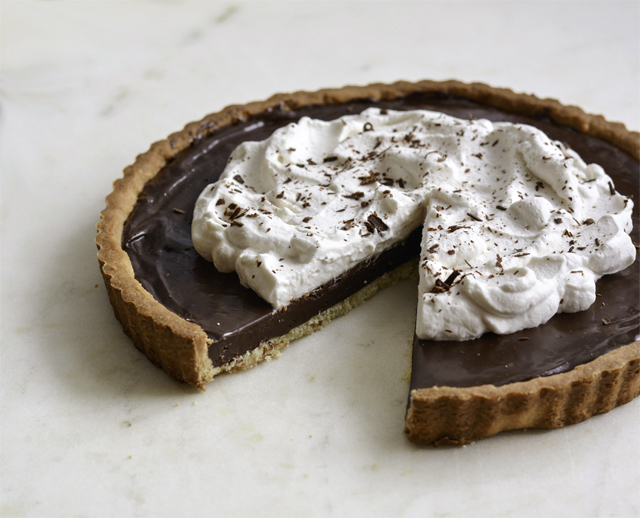 After all, this tart/pie features a sugar-cookie-esque crust and a silky, slightly spicy, chocolate ganache filling. I made a version of this pie (sans the spice) in one of my classes, and most of the students didn’t think it would amount to much because it’s so simple. One bite, and they changed their minds. One of the things I love about teaching cooking classes, is blowing minds. The recipes that appear simple and, dare I say, boring, always end up being class favorites. I get a real sense of accomplishment when that happens. I used cinnamon, nutmeg, and cayenne to add spice to this recipe, and a little bit goes a long way. Just a pinch of cayenne is more than enough, and same goes for nutmeg, because it’s powerful stuff! Cayenne and nutmeg can be very overwhelming if you’re heavy handed when adding them. The filling will steep for about an hour, and in this time, the flavours with develop. If after an hour, you still want more spice, add a pinch more to achieve the level of spiciness you want. Happy Pi(e) Day! 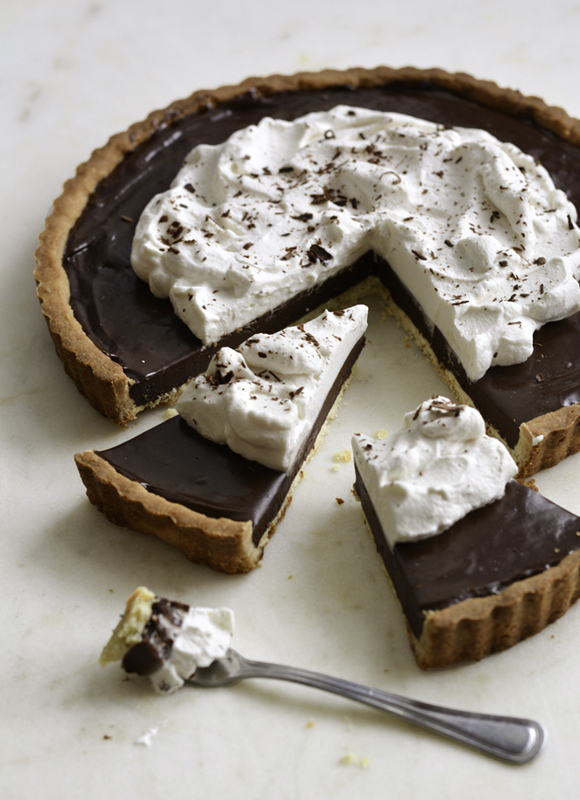 In honour of 3.14.15 I've whipped up a chocolate pie with a spicy Mexican twist. Add flour, icing sugar, and salt in a food processor and pulse a few times to combine. Add the butter, and process until the butter is blended coarsely. Add in the egg yolk, and process in 10-second pulses, until the mixture is granular, and clumps begin to appear. Dump the dough onto a work surface. Finish blending the dough with the heel of your palm. Form the dough into a disk, and place between two pieces of parchment or wax paper. Roll the dough, making sure to turn the disk frequently to ensure it's even. The dough will be about 1/8 inch thick. Refrigerate the dough for 2 hours, or freeze for 1 hour. When ready to bake, allow the dough to sit at room temperature for about 10 minutes, or until it's pliable and can be formed without breaking. Remove the dough from the paper, and form into a buttered tart pan. Trim the excess, and prick the bottom with a fork and freeze for 30 minutes, or longer. Lightly butter a piece of foil and form to fit ontop of the crust. Place pie weights, dried beans, or rice on the foil. Bake the crust for 25 minutes, then carefully remove the foils and weights, and bake for another 7-10 minutes. Cool completely. In a medium saucepan, combine the cream, cinnamon sticks, nutmeg and cayenne powder. Bring to a boil, and set aside. Place the sugar in a skillet with high sides, and over medium heat, melt the sugar. Stir occasionally with a silicon spatula until completely melted. You want the sugar to be a rusty amber color. Remove the skillet from the heat, and pour in the hot cream. It will bubble furiously, so be careful. Stir the mixture to make sure all the caramel is incorporated and not stuck to the bottom. Allow the mixture to steep for 1 hour. Discard cinnamon sticks, and strain the mixture. Put the chocolate into a heat-proof bowl. Reheat the cream mixture, bring to a boil over medium heat. Pour hot cream over the chopped chocolate, and allow to sit for 1 minute without mixing. 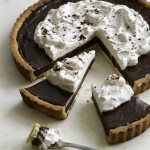 With a spatula, mix the cream and chocolate until you have a thick, silky ganache. 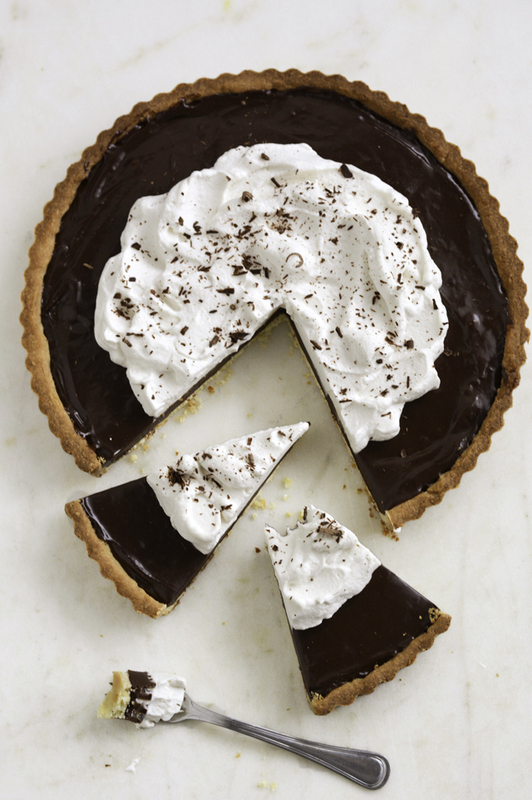 Pour the ganache into the cooled pie crust. Refrigerate until set, at least 2 hours. * A word on Cayenne: I found that about 1/8 tsp was just enough to know it's there, but next time I might try bumping it up to 1/4 tsp. The nutmeg and cinnamon also contribute to the spiciness. ** Mexican chocolate can be found in most ethnic aisles of grocery stores. I somehow manage to miss pi day each year … boo! Next year, I am totally making pie!! Icing sugar? Do you mean powdered? Want to make sure I get it right!! Looks awesome! 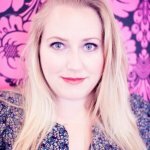 Hi Allyson, here in Canada, icing sugar refers to confectioners’ sugar or powdered sugar – it’s one in the same. Happy Baking!